Thanks for joining me, stamping friend, for another challenge with the Watercooler Wednesday Artists! Isn’t that a gorgeous picture to fuel your imagination? For this challenge, you must use the colours Tip Top Taupe, Soft Sky, Whisper White and Silver. I started with a panel of Soft Sky cardstock, and embossed it using my Big Shot and the Gently Falling Embossing Folder, to give the impression of snow. I wanted there to be more snow on the ground, so I used the Big Shot again, this time with Whisper White cardstock and the Swirly Scribbles Thinlits Dies. I really like this wavy die cut; I used Tombow glue to attach it at the bottom of the panel, to give the impression of drifts of snow. 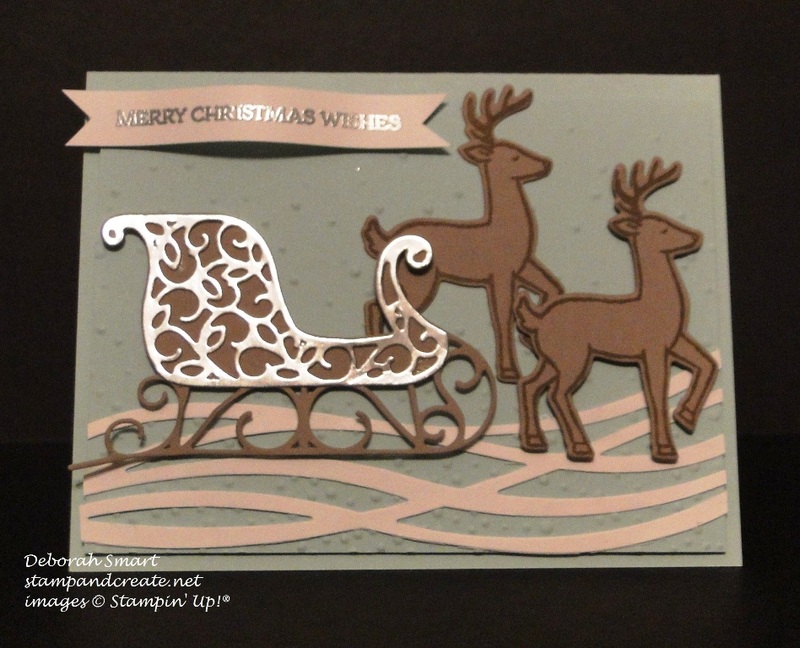 I got a lot of use from my Big Shot on this card – this time, I used Tip Top Taupe cardstock and the Santa’s Sleigh Thinlits Dies to die cut the base of the sleigh and the 2 reindeer (after first stamping them in Tip Top Taupe, using the Santa’s Sleigh stamp set). I then die cut the intricate silver sleigh scrollwork overlay from Silver Foil Paper. **Demonstrator Tip – Bundle both the Thinlits and the stamp set & Save 10%! I used Tombow liquid glue to attach the silver overlay onto the sleigh, and to attach the 1st reindeer directly to the panel. Then, I used Stampin’ Dimensionals to attach the sleigh and the 2nd reindeer. The sentiment, also from the Santa’s Sleigh stamp set, was stamped onto Whisper White cardstock in Versamark ink. I then covered it with Silver Embossing Powder, then set it using the Heat Tool. After snipping banner tails on each end, I then gently curved the banner using my Bone Folder, then attached it to the panel using Dimensionals. Finally, I attached the whole panel to a card base of Soft Sky cardstock. I like having the card base & panel both the same colour for this card; it adds a bit more depth. Thanks for spending some time with me today; if you don’t already have a demonstrator and would like to purchase the supplies used for this card, you can click on the images below to go directly to my online store. Next Next post: Another Fun Kick-Off Party! Deborah I absolutely love the composition of your card this week. It’s beautiful. You’ve used that sleigh and reindeer in all their glory. The silver on the sleigh over the Tip Top Taupe really makes it stand out. Awesome! Hi Deb, love your creation. I totally get what you mean about things coming to you when you stop worrying and obsessing about them. And this idea of yours is a winner. I especially love the way you’ve given a bit more life to those reindeer by having them at different levels to the sleigh. It makes the whole scene less formal and draws one in. Love it! Such a cute card, Deborah. I love the snow drifts! I might have to “steal” that idea! The silver sleigh is beautiful!